Once upon a time decades ago on a planet near you, there lived a woman who heard that gratitude was a beneficial spiritual practice. She tried to be grateful. She tried hard to take the prescribed medicine of sitting quietly at the end of each day, searching through the day for something — anything to be grateful for — barely if ever succeeding. It was pitiful! Her gratitude journal day by day was slim-to-none and soon abandoned. Can you relate? Today this woman is no more. In her place is rejoicing. She gives freely of This Love knowing that gratitude is a boundless attitude of simply Being This in a Real-m in which only This Is. The two are One. How is This accomplished? It’s not. It’s a given. We cannot accomplish what is already so. However, there is a how to the pitiful suffering of misidentification and misunderstanding. The ego’s self-surviving machinations, coupled with the wounded child’s painful deficient emptiness, make for a toxic stew pot of malnourished existence. Even our Thanksgiving feasts are like that. It’s the very illness the indigenous people saw when the refugees and immigrants, fugitives of their time — the explorers and settlers seeking the new world — found their way to these shores. Unfortunately, they brought the old world with them. Fears and judgements, competition and rivalry, scarcity and deficiency — the how — were not liberated in the freedom of a new beginning. 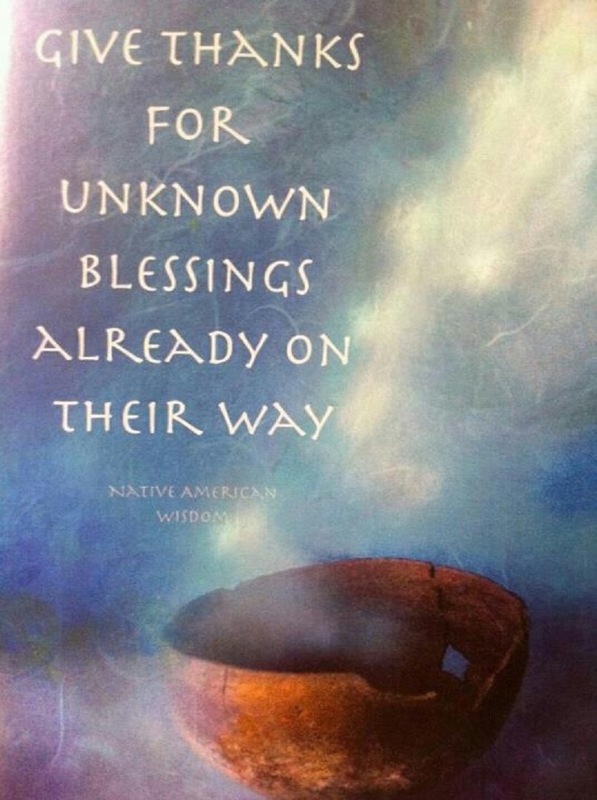 The Giving Way, practiced by indigenous people giving away all for the good of all, is an actual ritual, a ceremony of life and love which is highly regarded by native peoples. It is the source of the original Thanksgiving feast. It was taken advantage of and later actually forbidden by US governmental powers. It was and is a threat to the economy. Hence, the current day stand all tribes of native people are taking at Standing Rock Sioux Reservation represents an over five hundred year history of opposing philosophies and views of Life. Giving Way has more profound implications for sacred life. The self-serving ego gives way its existence so that the Essence of Life may prevail. This is the greatest gift any of us can give. The Giving Way of Life benefits all people, planet, all the sacred universe of Being. Life is then realized to be a matter of living by grace, giving such that the glory of the Presence of This all- powerful Love may be known. No one, no ego can do this. It is how This we are naturally functions — we don’t have to and in fact can’t do it. Therefore there is no how. For a long time, for the woman in question, it seemed as if she was seeking the Truth to set herself free from suffering in the delusion of separation. She practiced daily and almost constantly to realize what is real and true, authentic and alive. In that process it seemed as though the seeker kept dying in the finding and in being found by inherent inner Peace, Silence and Stillness. The vacillations of incarnating as somebody doing something and dying over and over eventually killed her. Her heart was broken open again and again as deeper and stronger compassion for human suffering and its causes arose in her experience. Her love for humanity became boundless in the Light of This sacred Heart. Finally word came from an Indian man known fondly as Papaji, who through his disciple Gangaji said, Call off the search! The seeker is Who is seeking. Our intrepid seeker was just confused in identity by virtue of conditions of separation consciousness. Unconditioned consciousness was revealed as her very nature and being. The Presence was realized and over time embodied and lived as one complete all-inclusive whole. She discovered the secret of the powerful action: live the highest truth you have recognized whether or not you are experiencing it. Cleave to Jesus. Our whole life must be simply woven into Jesus. Jesus as Christ represents and embodies Love and Freedom; Unity Consciousness. 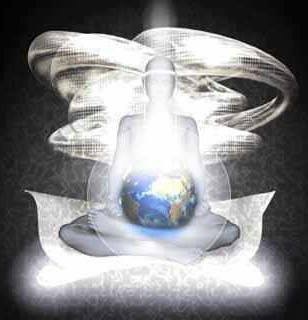 Cleaving to Unity Consciousness and inquiring into experience, diving into the heart of the matter with presence (unconditioned conscious awareness) revealed to her that Presence Is the Essence of everything. This happenstance, that feeling, that thought, sensation, divisive relationship, situation and circumstance — they all showed the deeper dimensions and aspects of Essence working out throughout her being and all life’s experiences. An inner insistance to find and know the truth and the Real no matter what was actually This Love and Grace in action in her soul, mind, heart, body and spirit. Nothing but the whole perfect and complete Truth would do. The feelings of rightness, accuracy, benevolence and well-being that followed on its heels were just the icing on the most nourishing feast of all — the daily manna supplied without ceasing from the Within to the without. Gratitude gives way to rejoicing as miraculously, perception of the most misbegotten experiences is raised up in unity consciousness. She, as a little child was told a foundling myth of being dropped off at the back door by Chief Katonah. Her family gave her a tribal name: Gigglywachemach. Aptly named, she giggles a lot these days. The Truth she realizes is that This stays, remains always as Omnipresence. Right in the midst of and with all our human experiences, This, our LightHearted True Nature, Is Being Human. This is transforming, transducing, transmuting the malformed misperceptions when our consciousness is open and receptive Hereunto. Realization embodies in morphogenic resonance with primordial sound. The Word is made flesh in original innocent blessing as the direct emanation of Original Cause. We actually live in the Garden here and now innocently wise giving way to This; in This Giving Way. What is being described is the literal unadorned truth: we live as the as yet untapped potential of Being This Alive in human expression. Our far from pitiable woman lives the ceaseless creative expression of the self-actualizing Presence. Its constancy is ensouled in her Life of Being This Only, This that only Is. This gives all Itself, gives Its all in the Holy Instant, the eternal Now in which all time and space exists simultaneously. She lives like a Holy Fool in the instantaneity and intimate immediacy of the spontaneous arising that cannot be foretold or anticipated: never been before, never will be again, gone as soon as it expresses, Giving Way to the next wonder of ceaseless benevolent generosity of Spirit. She enjoins all who reach out to her through generous offerings shared freely in order for each to discover what is Real. This is how she lives. There was nor is anything she can do to make it so; it simply is a matter of fact of True Nature. As such it is divine science, a lawful, orderly, and organized open living system of conscious knowing dynamic aliveness: spiritual ecology. In the whirling ever-changing nature of expression in formation, This Life is an on-going creative work of art never completed nor finished, yet derived from wholeness, perfection and completion of unsurpassable beauty and brilliancy, splendor and glory. Because This we are is incomprehensible, beyond all conceptions of the mind, yet fully alive and present right here, we are a grand unsolvable living Mystery. How wondrous to Be This Alive! In and as This, we are enabled and empowered to walk freely, untrammeled in a world of madness that is daily marching toward oblivion in incarcerated, limited and identified thoughtforms and beliefs. We can brave the torturous prison camps and insane asylums of desperation that lack conscious awareness of This unconditionable Love alive. We can Be Giving This a-Way and that-a-way to every one we meet and to the world we, as This, encompass with our full, whole and complete overflowing Being. We are given to live as mystics without monasteries, in the sublime Real-m, the great universal satsang hall of pure Being in this world but not of it. Rejoicing, we draw to us those ripe for awakening, realizing and living This only. We can be deeply moved by the suffering of our companions — the One we all are — and embrace all in the open ever-loving Heart of This LightHearted Being. As This, we are free to access and respond accurately and precisely to the formation of the moment by virtue of Omniscience — Omnipotent and Omnipresent — the Almighty trifecta of our True Nature purely and humbly, solely (soul-ly) by virtue of Being This Real, This that Only Is. We are The One and Only. We’ve only to relax and open Within, stop internal activity long enough to Be Still and Know, and This Substance flows directly in to infuse and overflow the loving cup of our unique, essential and instrumental life and expression. So let’s all give thanks for the unknown blessing already on Its Giving Way. We are The Holy Fool enraptured in and by This Love. And that’s the Truth! The writing of this could not have been completed without the kind and awakened editing assistance of Amaya, co-creator extraordinaire. Many thanks for her incredible participation in This Unfolding living LightHearted Mystery we are. This entry was posted in Contemplation and tagged abundance, conscious awareness, devotion, direct experience, Inquiry, The Giving Way. Bookmark the permalink.